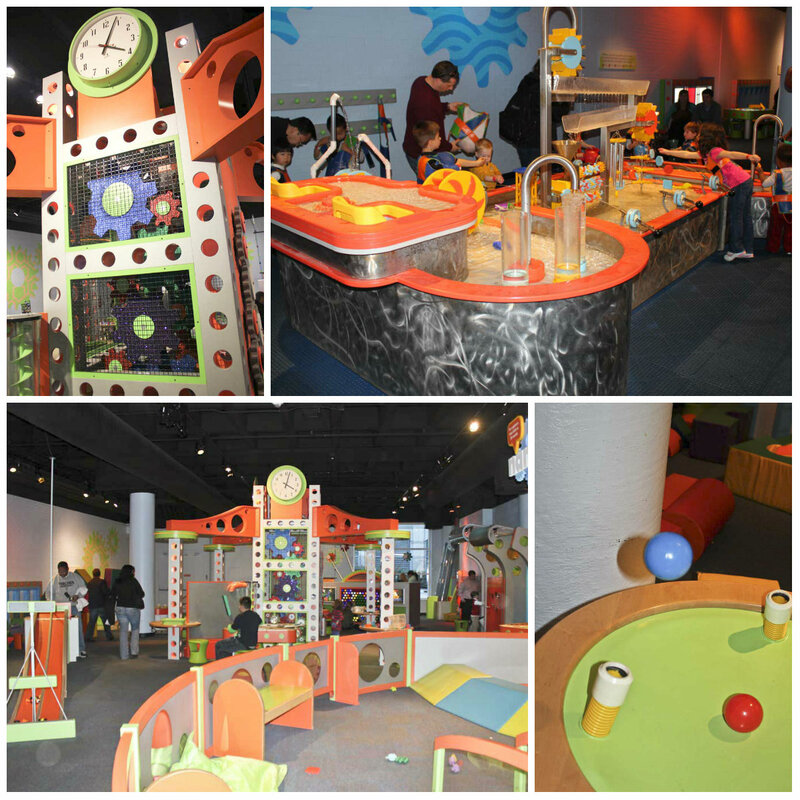 Stepping into a world where science is brought to life through interactive exhibits and explosive experiments sounds like a fun day for me. I love science and exploring how things work, but making that exciting for a 1.5 year old is difficult. 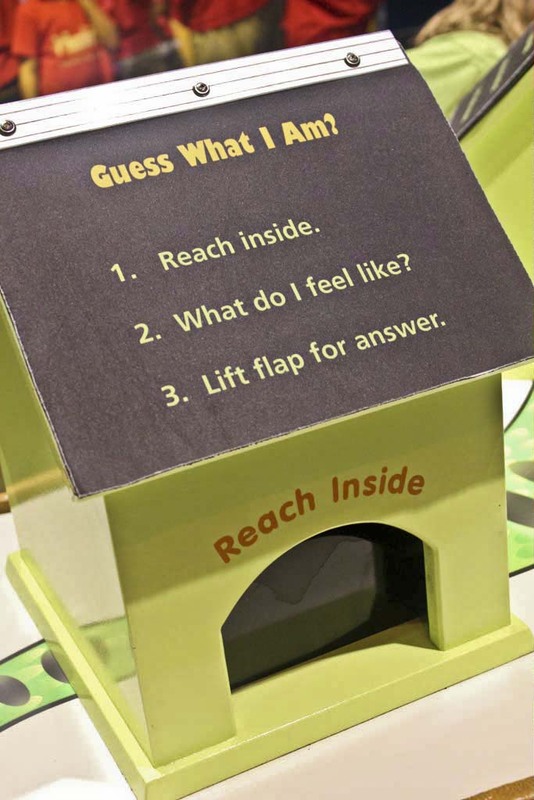 The Discovery Place in Charlotte, however, manages to do just that. Yesterday, we spent the day immersed in a world of wonder where there was something for everyone… even Athena. 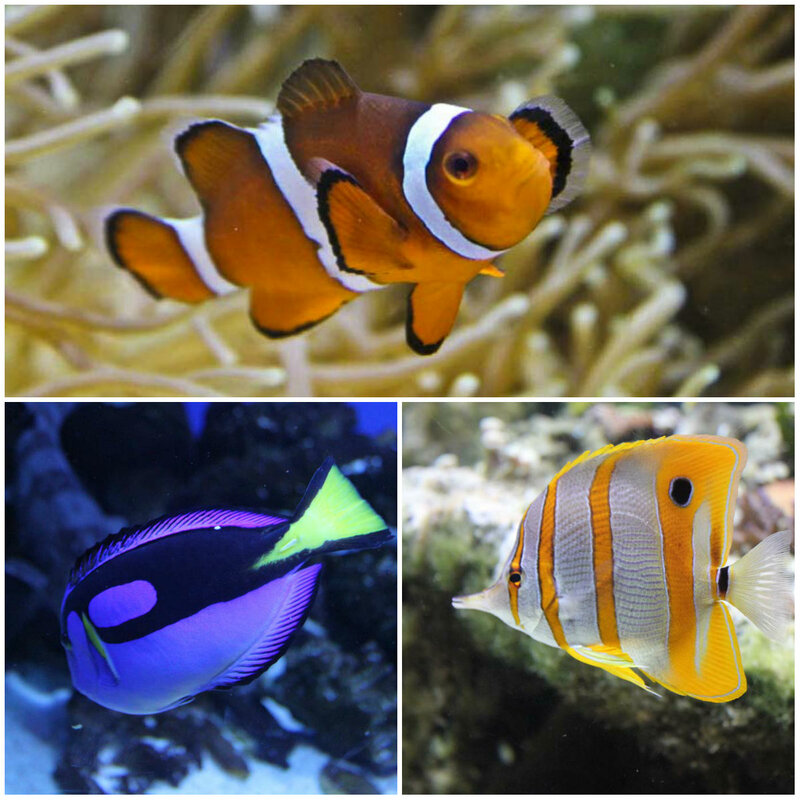 Watching the fish swim around in their own beautiful, underwater world captivates me. I could stand and watch them for hours. They always seem busy and active. I wonder if they are working, communicating, creating relationships…. Their bright, bold colors remind me of a painting; they seem too vivid to be real. Playing memory games or figuring out puzzles always holds my interest as well. Even the Animal Grossology section had a few interesting exhibits that I surprisingly enjoyed. The “Guess What I Am” game had me wondering what I was getting myself into. Thankfully, there was nothing alive or grabbing me back. 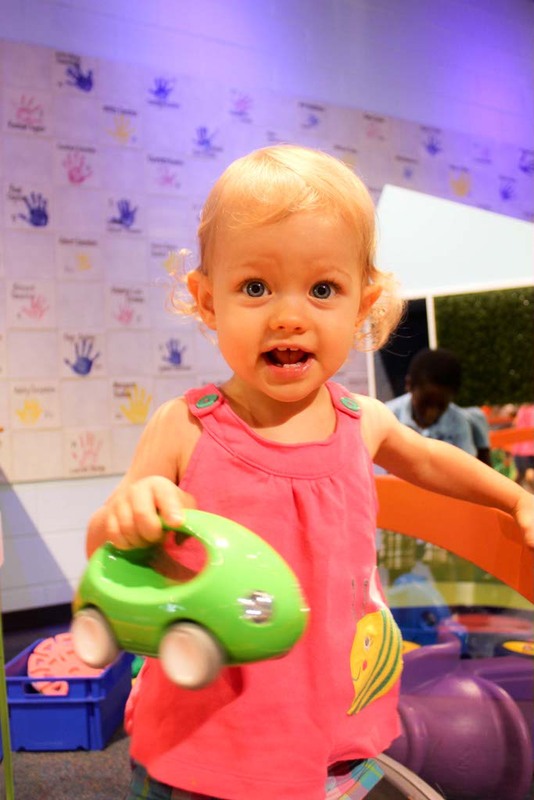 My day was already going swimmingly well, but the excitement on Athena’s face as she explored the Discovery Place Kids section will leave a smile on my face every time I look at the photos. 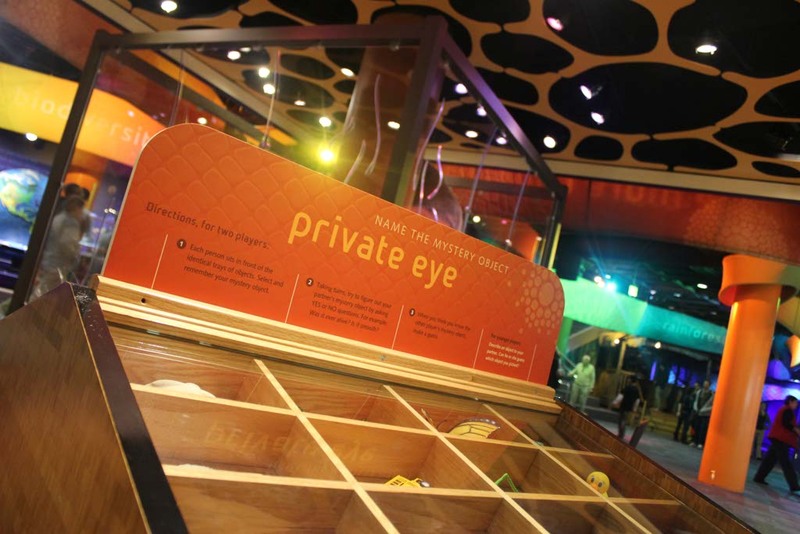 If Discovery Place is great for teens and adults is is just as great, or even better, for children. She played in the water, she banged on the pots and pans, she watched the clock tower, and she climbed on the bridge. She was completely transfixed by the new, adventurous world around her. As I watched her try to figure things out and contemplate climbing the steps of the bridge, I was reminded of how much she’s already like me. When I watch her, I feel young again. She opens my eyes to life and the sense of wonder that exists around every corner. Although it’s busy during the summer, I’d be happy spending every day at Discovery Place even if it was just watching Athena in the Kids section. 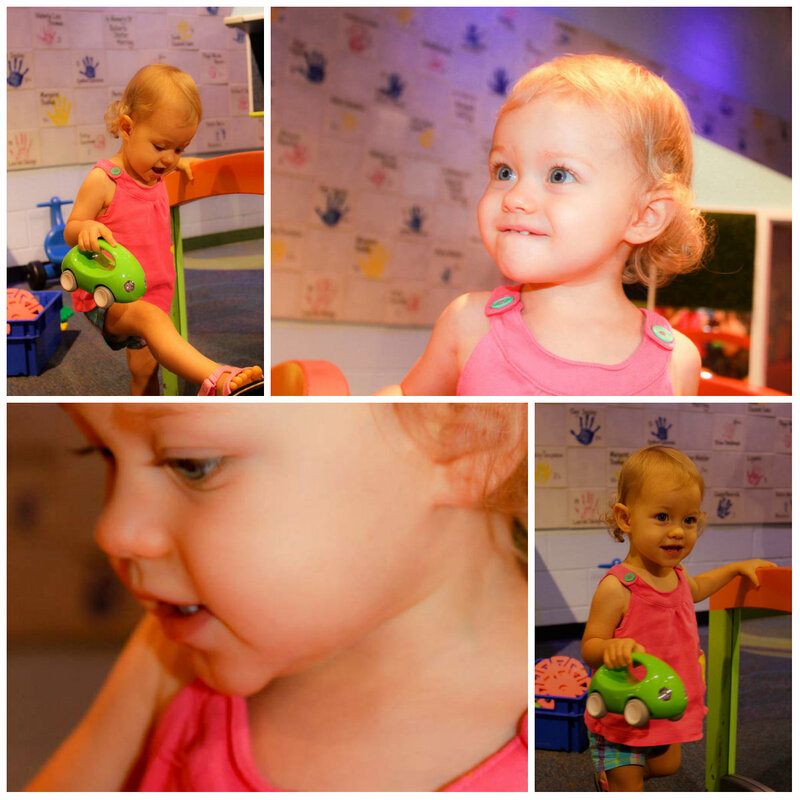 Watching her helps me to rediscover that childlike wonder and Discovery Place brought that out in both of us. This entry was posted in Charlotte, Charlotte Entertainment, Family, Family Travel, North Carolina, Travel, USA and tagged bucket list, Bucket List Publications, bucketlist, Charlotte, DiscoveryPlace, Family, Lesley Carter, North Carolina, USA by lesleycarter. Bookmark the permalink. The fish are lovely to look at. Yes. The children’s area is so colourful, I can to visit it too. Athena takes after her Mom in more ways than one. She sure is gorgeous! A few years ago I took my 6 or 7-year-old granddaughter to the Discovery Centre here. What fun, even for the mothers. It’s gone and is now a restaurant. Grrr. Going with the kids is great. I had a great time raising my daughter and taking her everywhere too. Like yours she has that great character in her face. Happy, always learning kids out of a classroom and away fromt he desk. She’s a real cutey and did I see her blushing in the last picture? Haha!!! amazing and lovely pictures, You are blessed to have such a beauty in your life. We were on vacation in Raleigh this spring and took our 7 year old to Marbles. He had an amazing time. It looks really similar to this place. I too love everything science. The Museum of Science and Industry is always a great place to visit if you ever come to Chicago. It along with the Shedd Aquarium and the Field Museum are some of my favorite attractions to go to downtown. What a goegeous, inquisitive little treasure she is! Aww! I so love to find places like the Discovery museum. Travelling with kids, these kids of places give us the best experiences – wish we had Charlotte on our itinerary! There’s nothing like that here, we are sooo behind the times. Mind you, I don’t think the UK has many places as good either. The Science Museum in London has a great area for little kids, where they wear different animal feet and follow their prints, and draw geometric patterns on huge screens, but no fish. This place sounds like a great mix – simple ideas, well-executed. Athena is gorgeous and clearly as curious as her mum! We never made it here when we lived in Mooresville for some reason! I am not sure why! Maybe because the boys were a little older and we didn’t think it would be for them? I don’t know but you did a great photo review of it!! Sounds like a very fun day! As a registered early childhood educator, I give this place 2 thumbs up!! The wonder of a child make us re-open our own eyes to the mysteries that surround us every day. Beautiful pictures. Nice blog. It’s amazing how children grow. We are finding it out watching our 11 month old grand daughter Maya. Had to reblog this – looking through a child’s eyes is again is just so powerful – and science rocks! Seen through the eyes of a child, the world becomes a magic place. Had to reblog this too to Musings of a Penpusher. Thanks so much for sharing. My in-laws just helped to fund and open up one in Rockingham after they went to the one in Charlotte. Me and Noah are looking forward to when we can check it out the next time we are in North Carolina!! These experiences will be so good for Athena! Nice entry. Museums are doing such a great job these days of getting people interested in interacting with science (even our little “future-people”!). @kandjcolorado I’m from NC and the one in Charlotte is bonkers-awesome. Wow, just love the expressions on Athena’s lovely face. Gorgeous photos and an even more gorgeous Athena.